From Bulgaria to Mexico, Australia to Poland, people from all walks of life are gearing up for the fifth annual Wings for Life World Run. Since its inception in 2014, World Run has raised millions for the Wings for Life Foundation to fund research into a cure for spinal cord injury. 100% of race proceeds go towards this worthy cause, and now we are challenging you to run for those who can’t. The best thing about Wings for Life World Run is that everyone’s a winner – simply do your best to beat the catcher cars to stay in the running. There’s no finish line, just a bunch of incredible, like-minded people coming together to raise awareness for a great cause. No matter who you are, where you come from, or what life has thrown at you, all you need to do is step up and show your support. 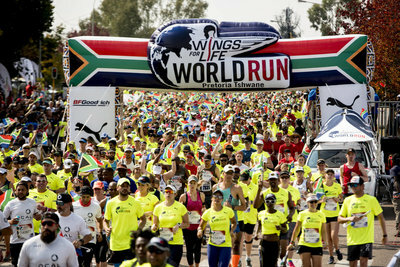 For more info and sign up details, visit the Wings for Life World Run website, and tell your friends!